After receiving shaktipat, numerous experiences began to occur. One night at home, I heard the conch shell sound so loudly and clearly that I started. Interpreting that I was being beckoned to meditate, I did so. The energy had been thick with power all night, and I was frightened. As I sat facing the shrine I became nearly immobilized physically and mentally as I realized I wasn't alone. A sound in the hallway confirmed my belief, and summoning up all the courage I had, I turned to look. He was standing in the doorway - a being made of light. The beauty and vibrancy of this sight were not of this realm. He was a beautiful Indian man with luminous blue skin and long wavy black hair. His attire was flowing and regal, and a notable hat of red trimmed in shimmering gold was worn on his head. The fear and excitement which consumed me is beyond description. Unable for this reason to keep my eyes upon him, I turned away, inquiring mentally, 'What do you want me to do?" "Bow down," he replied, so I did, being afraid to move, but even more afraid not to do as he said. Some time having passed, I cannot say how long, I looked behind me. He was there, too. For some reason, I do not recall clearly how long the experince lasted or how it ended. I do remember that when I finally calmed down, I couldn't bear to part from the blissful pull of the shrine area. My bodily senses had been enlivened: the candle flame was felt in each of my ten fingers, the fragrance of the roses was smelled from across the room, and food possessed a keener flavor than ever before. The following weekend I travelled to the Ashram. As I entered the room where Shankaracharya was sitting, I was completely amazed to see him wearing a hat like the Blue Man's. He had just brought it back from India, he explained. From that point on I have been filled with a love and devotion for Shankaracharya that is beyond both words and understanding. This love has only grown and grown. Sometimes a state of such intense love is experienced that I feel I am going to pop. God had appeared wearing the hat of the Guru to show me the Guru. 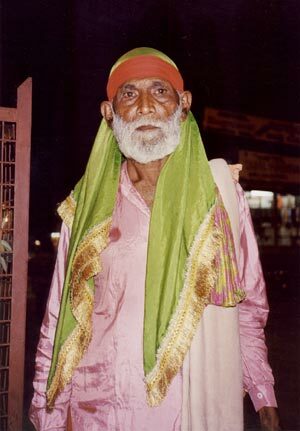 In the fall of 2000, I traveled with Shankaracharya to India on pilgrimage. We were visiting Maharastra holy places and stopped during Deepavali at Shirdi, home of Sai Baba. Sai Baba is the Christ-like figure of India, whose photos are seen everywhere. Although he died in 1918, he is still spiritually active. Countless miracles and appearances continue to be attributed to him. We entered Sai Baba's mahasamadhi (tomb), where thousands go daily for blessings. As we approached his beautiful, life-like murti (statue), the thought arose in my mind of taking a picture for our ashram. Since taking photos is not permitted in many temples, I asked Sai if it would be ok, but the line of people was moving swiftly and we were pushed on through. Shankaracharya later told me that he had asked for blessings for the spiritual work he is doing in the West, and for the purification of all karmas (effects) that might be obstructing it. We returned to our room, where Shankaracharya had to lie down, due to the intense pain (which would last for days). Soon he said, "We have to go back." He felt we'd seen Sai and didn't recognize him, and that Sai, knowing the effort required, might come again. So we went back to the temple and sat in the same place for quite some time. But still no Sai. Shankaracharya said, "Well, he knows that we have tried. Let's go in for darshan (viewing of the image), pay our respects, and go." After darshan, as we neared the edge of the temple complex, I was astounded to see Sai emerge from the darkness. I exclaimed, "There he is!" Shankaracharya ran and offered his salutations to Sai, who appeared to be quite pleased with him. Sai asked for some rupees (money), and Shankaracharya enthusiastically gave what he had. (In Sai's leelas (his play) the amount of rupees is always significant to the boons he bestows.) Sai blessed him by touching his third eye. I was hoping he would touch me, then he called me over and touched my third eye as well. Shankaracharya asked, "Can we take your photo?" He posed again, and I quickly took it, then he darted towards his shrine. He seemed rushed, probably because people were beginning to gather. Interestingly enough, we didn't see anyone dressed anything like Sai in the temple, or in all of India, for that matter. He had appeared for this photo in the fluorescent colors auspicious to the Divine Mother (our tradition). It seemed he didn't want the hordes of people to recognize him, yet his appearance as a sadhu was still quite similar to his original earthly form. All glories to Sai! May you be blessed by this photo! I was traveling with Anandamayi on pilgrimage to the Dakshineshwar Kali temple near Calcutta. This temple is a world famous pilgrimage site of the Divine Mother and is well known as the home of the great Avatar Saint, Shri Ramakrishna. We waited patiently in line as many people were there that day. I was behind Anandamayi as we rounded the corner and she saw the Mother. Anandamayi immediately entered Devi Bhava (the Devi expresses herself in the body). She let out the shrill Kali calls, various blessing mudras, and displayed the dark, outstretched tongue characteristic of Kali's manifestation. Although I have seen Anandamayi enter Devi Bhava many times, this was the most intense - the Mother was fully manifest in her. The temple priests' attention was focused on Anandamayi and many people were coming to her for blessings. This resulted in a congestion of people and a guard who came to convince Anandamayi to stop and go away. Instead, the people chased the guard away. I carried Anandamayi to a nearby pavilion where the manifestations continued. Hundreds came for the blessings, which went on for hours. I consider this to be extremely significant. For the Mother of the Universe to manifest in order to personally bless her devotees in front of her most sacred site is exceedingly rare. All glories to the Divine Mother and Shri Anandamayi!